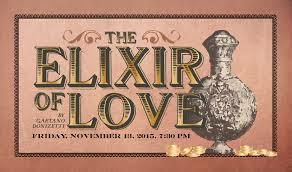 Last Friday evening, November 13, Opera Western Reserve presented as its 12th annual production Gaetano Donizetti’s The Elixir of Love (L’elisir d’amore), an opera buffa in two acts. For a dozen years the company has mounted excellent operas, shrewdly limiting itself to a single annual performance and consistently playing to full houses while maintaining high artistic standards. Friday night’s performance was no exception. First-rate lead singers, fine preparation of choral numbers and ensembles, excellent blocking onstage, and a wonderful orchestra all contributed to another resounding success. Donizetti, one of the greatest bel canto composers, penned 70 operas, of which the delightful comedy Elixir was the 40th and among the most successful. Though written almost hastily in six weeks, it was the most performed opera in Italy between 1838 and 1848, and it has remained continually in the international opera repertory to the present day. The intricate plot centers about Adina, a capricious wealthy country girl loved by both Nemorino, a young peasant farmer, and Belcore, a conceited army sergeant whose troops are billeted in the area. While Adina keeps her two suitors guessing, Dr. Dulcamara, a traveling snake oil salesman and quack, lands in the village with great pomp to sell his wares. Nemorino purchases a bottle of the Elixir of Love from him and drinks it all. He next meets Adina in a tipsy condition, and his disrespectful behavior causes her to accept Belcore’s marriage proposal. Belcore’s troops are then mobilized and he begs Adina to marry him immediately. In a panic, Nemorino tries to get another bottle of the Elixir, but is refused by Dulcamara for lack of funds. Discovering that Nemorino needs money, Belcore encourages him to enlist for the 20-crown bonus. After enlisting, Nemorino runs back and buys the Elixir. In the next scene the girls of the village discover that Nemorino’s wealthy uncle has just died and left him a huge fortune. Nemorino, unaware of that development, attributes their interest in him to the Elixir. Upon hearing from Dr. Dulcamara about Nemorino’s devotion to her, Adina pays off Nemorino’s debt to the sergeant, announces her change of heart, and gives her hand to Nemorino. Youngstown-born soprano Randa Rouweyha was terrific as Adina. Her lovely lyric soprano voice gracefully negotiated the many intricacies of the challenging bel canto role. She proved to be equally exceptional in the ensembles. Tenor Pedro Willis-Barbosa, a native of Bahia, Brazil, was excellent as Nemorino. His vocal quality was pure throughout the wide-ranging role. His most expressive solo moment was in the famous second-act aria, “Una furtiva lagrima” (“One Tiny Tear”), which bears the same relationship to the overall opera that Ernesto’s Serenade does in Don Pasquale. Bass-baritone Jason Budd, also born in Youngstown, took every advantage of the buffo role of Dr. Dulcamara. The part calls for a comic expansiveness and satirical mien that came naturally to him. Baritone Michael Young, a native of Cortland, Ohio, had a gorgeous dark vocal quality. He projected the conceit and pomposity needed for the Sergeant Belcore role very effectively. Soprano Kathleen Bachtel and baritone Robert Pierce, as Gianetta and the Notary, were excellent in their supporting roles. Bechtel’s role was somewhat larger, and she projected her fine voice well. Adina in Act 2 — were both superb. The latter melody recurs in the final scene of the opera as a solo aria sung by Dulcamara with different and more pointedly sardonic words. The large ensembles with chorus flowed very well, though the energy flagged a bit towards the end of Act 1. Act 2 dashed to its happy ending with verve and vitality. The costumes were most effective, and the bright red of the soldiers’ uniforms helped intensify the flow. The sets were a bit drab, with the exception of Dr. Dulcamara’s enormous white snake oil dispensary, which was a feast for the eyes. Conductor Susan Davenny Wyner was terrific in maintaining the musical continuity, keeping a consistently good balance among singers, chorus, and accompaniment. The small orchestra, playing a reduction by Bryan Higgins, performed with grace and power. Published on ClevelandClassical.com November 16, 2015.